Thailand’s street food scene is well renowned, and Bangkok is widely regarded as among the world’s best spots – if not the single leading place – for street food gorging. It’s no accident that Thailand is home to such rich culinary traditions, or that the variety and quality of dishes offered by its mobile hawkers is so rich – rather, it’s the result of foodie traditions and developments that stretch back over decades, if not centuries. The sheer number of migrants from Thailand’s northeastern Isaan region is the reason there’s a papaya salad stall on every corner, for instance – both because cooking the cuisine of their hometowns is a way for northeasterners in Bangkok to make a living, and of course equally because there are hundreds of thousands, if not millions, of fellow northeasterners craving a taste of home, who want to eat what’s coming out of these streetside mortars. Meanwhile, the Thai tendency to eat little and often – in other words, to seemingly never stop grazing from dawn to dusk – lends itself to the street food culture, since vendors commonly serve small-ish portions, perfect either as a quick individual meal or for ordering multiple plates to share with friends. The desire for variety – to order perhaps a stir-fry, a curry, a soup and a salad, to create a table of flavours that balance one another out – also works to further the attraction of street food. In fact, this writer is one of many to argue that the streets are where you will find the very best that Thai cuisine has to offer. Like anywhere else, Bangkok of course has its share of excellent higher-end restaurants that turn out well-executed Thai and international food. But give me the choice of a spread of dishes from a collection of sidewalk vendors or a five-star hotel restaurant, and I’ll unequivocally opt for the former every time. That’s as much for the sheer expertise and respect with which I know my meal will be prepared – recipes and techniques often having been handed down between generations of cooks who specialise in just one or a few dishes – as it is for the vibrant street atmosphere. It’s not for nothing that, every time I return home to Bangkok after an overseas trip, my first stop from the airport is my local somtum stall for a meal of papaya salad, grilled beef, and a laab leuad salad of raw beef swimming in pig’s blood. For me, nothing but nothing beats that as a no-holds-barred welcome back to Thailand. Yet the future of Thai street food is in question. 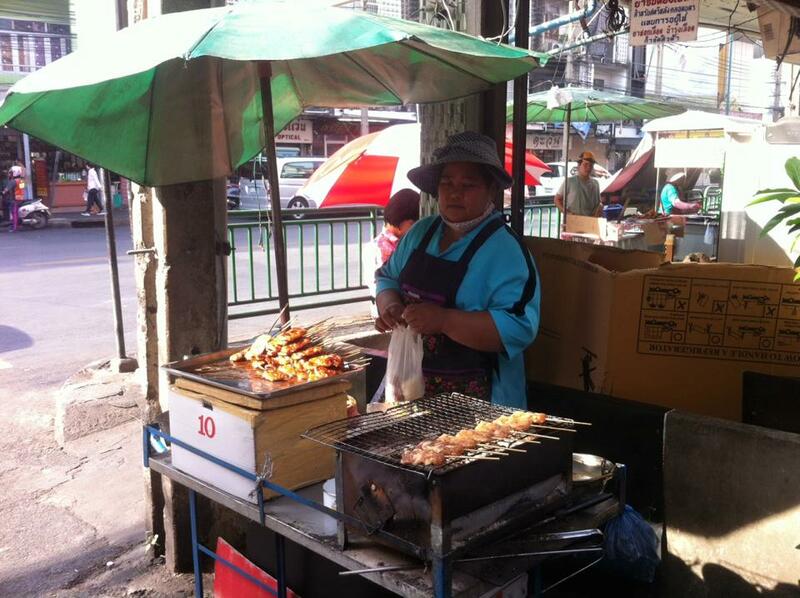 While the same has been seen on a cyclical basis of typically Thai ad-hoc enforcement for as long as many can remember, in recent years there have been renewed efforts to force street vendors (including those touting goods other than food) out of many areas, and to ‘reorganise’ market areas and ‘reclaim’ pavements and other public spaces. The argument goes that many street kitchens operate illegally, without permission and without paying ground rent, that they contribute to traffic problems for both drivers and pedestrians, and that at times their hygiene standards are questionable. 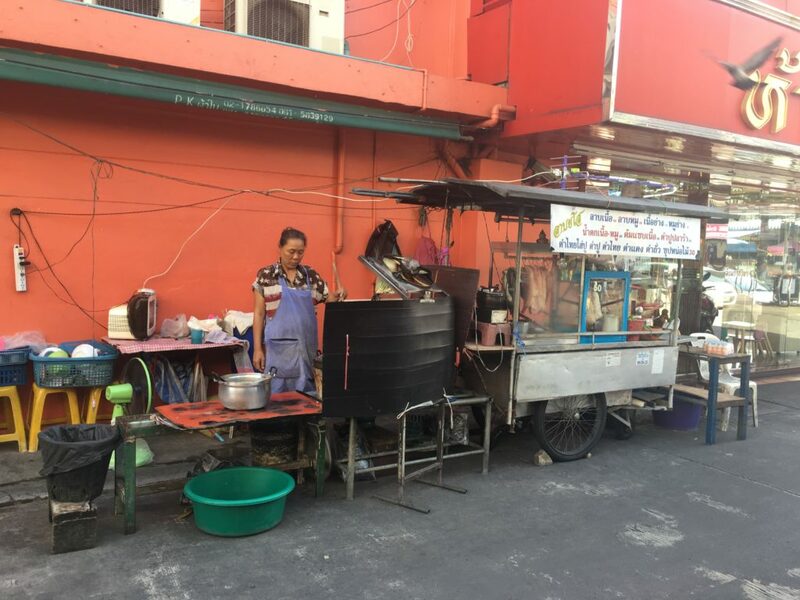 It’s difficult to disagree entirely with some lines of contention – but what’s equally hard to dispute is the fact that Thailand’s street food culture is invaluable, and that its loss would be a travesty. The smells, colours and sounds that street vendors add to Bangkok’s atmosphere are unmatched; vendors provide affordable mealtime options to working-class folk who simply don’t have the cash to eat in pricier settings (not to mention that the vendors themselves rely on the industry to make their own living); and from a tourism perspective, Thailand’s renowned street food scene is still a considerable draw for visitors from overseas. Street food in Thailand almost certainly won’t disappear overnight, but it does face ever-greater challenges to surviving in a changing environment. Many predict Thailand is heading the way of Singapore, where more organised and efficient hawker centres are often described as comparatively sterile. We’re pretty sure, though, that the Thai entrepreneurial spirit and simple love of good food will see street food through in the way we’ve come to adore it. What’s your relationship with Thai street food? Let us know in the comments! All photos by Chris Wotton. This tour is a great way to explore Bangkok by night and combining local life, temples, market and food. This tour is a great way to explore Bangkok by night and combining local life.